This rendering shows what is going to happen to the land between Highway 17 which leads to the ferry terminal and the Deltaport causeway. It is taken from the Retail Advisors Inc webpage which has details of what is going into highway oriented shopping development. The image itself is interesting in what it also shows in the way of low density housing. Rather oddly while the future commercial industrial area is indicated the existing container terminal and coal loading facility on Roberts Bank – at the end of the causeway – is omitted entirely. 52 Street becomes a 4 line divided road north of the Highway. This is what it looked like the last time the Google Earth satellite image was taken. I have spun it around so it has roughly the same view point as the drawing. 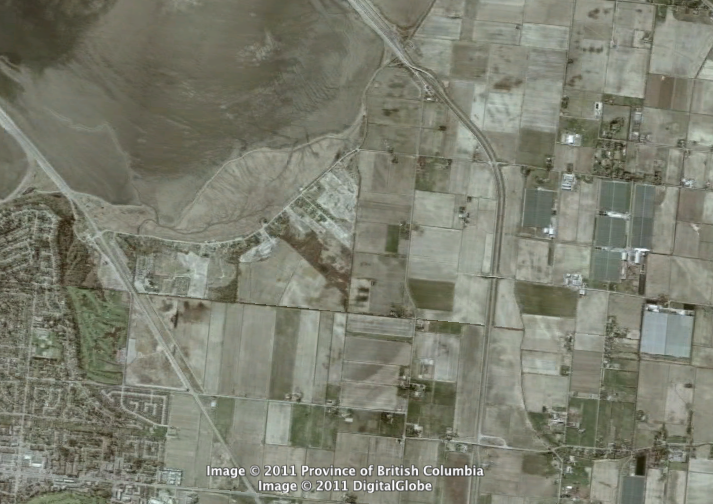 I have been around this area quite a bit recently – and what is most apparent is the speed of construction of roads across what was once some of BC’s best farmland. The South Fraser Perimeter Road starts here – with an intersection on Highway 17 over the top of the BC Rail line to Deltaport. And this more recent picture shows what is now happening at 41B Street where work is proceeding rapidly on a new railway overpass. This area is at the far right of the top illustration and will be industrial/commercial – mostly for the containers coming out of Deltaport. « What’s up with the Viaducts? Most housing in Tsawwassen is low density suburban “heaven” complete with 3 car garages. However, the town centre is centrally located within a 5 minute drive of almost every house and in recent years 4 storey housing has been built around the core to place a significant population within walking distance of “everything”. This new development will likely kill the old “downtown” and force everyone into a car or onto a bus. 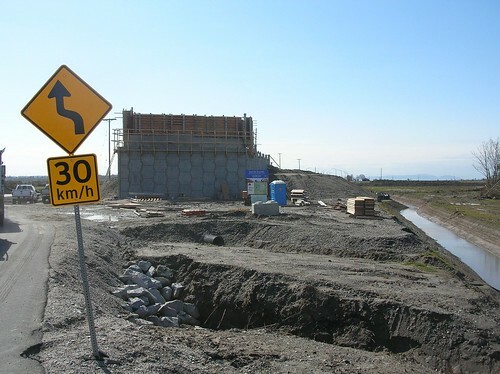 It’s ironic that after 40 years of fighting against the development of the Spetifore property Tsawwassen could be wrecked by something that seemingly nobody saw coming. This, I believe, is land that belongs to the Tsawwaassen First Nations, and is part of the deal struck with the provincial government a few years back that removes any further aboriginal land claim. It was exchanged for development rights. 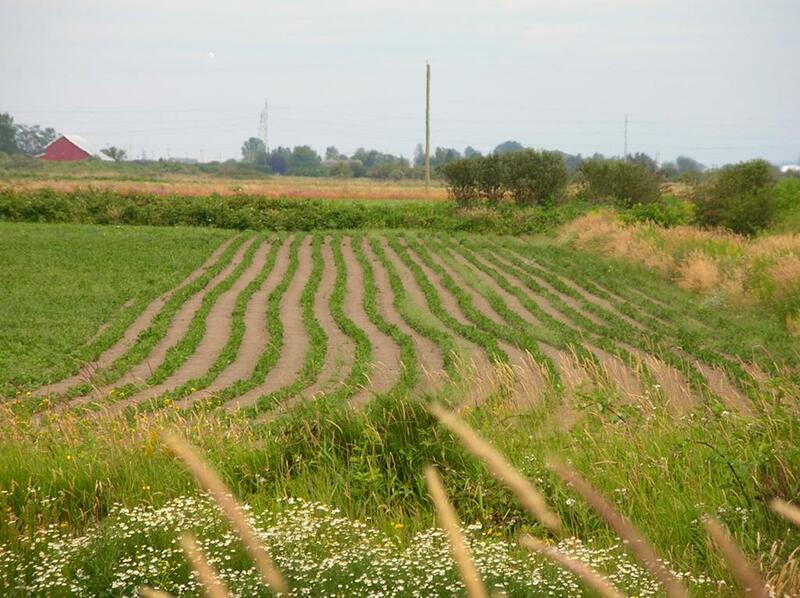 While the Tsawwassen have every right to develop their traditional lands, it is profoundly disappointing to see the form of development take on discredited and outdated models from the Sixties, and to see prime agricultural land become a low-value bargaining chip. I am quite critical of Delta council as well for being quite adversarial in their approach to their First Nations neighbours (witholding water and sewer services was on the table at one point). Who were there first … and never ceded their land? Now we’ll have the Tale of Two Towns, one about to be built n accordance with the Walmart School of Planning, the other a leafy holdout from the days when 7,000 square foot lots were deemed too small and were undervalued relative to the ecological footprint of their occupants. I wonder if anyone suggested a passenger rail link to the Tswawwassen ferry terminal with stations in Tsawwassen and in future in the development on First Nation’s land, with appropriate community planning principles attached? Negotiating development rights with First Nations doesn’t have to result in the destruction of farm land. It could’ve been negotiated in partnerships with government and other First Nations and developers on sites that are not zoned agricultural. The financial benefits would still be similar to developig a little closer to home. Having lived in Tsawwassen since 1963 and now living in a house overlooking the proposed development, the one question I have is: “Where are the punters coming from?” Tsawwassen is not noted as a shopping destination. What does become clear is the massive South Fraser Perimeter Highway and that massive interchange slowly rising above the farmland at Hwy 17 railway overpass. Already a massive renewal of water and sewerage pipes are taking place along 52nd and 28th. David, come to Tsawwassen as the 3 car garage house is the exception, not the norm and along 56th is mostly high density multi story condo’s. In fact most of the houses are from the late 1950’s to late 70’s, the few housing estates built in the late 80’s have the larger designer houses, that you allude too. I was always wary of the Campbell/Baird TFN land deal and now it seems that Campbell’s strategy has come to pass, getting farm land out of the ALR and building commercial and residential developments on it. The question now is, with gas currently at $1.35 a litre; public transit almost non-existent and the Canada Line will never be expanded in my life-time. I do not see much potential in commercial development and what I fear is a half built mini-mall, with deteriorating buildings, used mainly for storage for containers. I have had family in Tsawwassen heights since the late 1960’s. I don’t think there is a single home up there without a broad driveway and big garage. I may not have said it directly, but I support the medium density that has been built around the shopping centres. It has placed a considerable population within walking distance of all the core services. My fear is that the retailers within the walkable core will suffer if the new development attracts the large percentage of Tsawwassen residents who commute along Hwy. 17. Why shop in town if you’re already driving past a big box store with lower prices twice a day? The mega-development on TFN land is, hopefully, years away in this current tight economy. Meanwhile, concern over location and density of the Southlands proposal is now. An 8-12 storey Tsawwassen Tower would go a long way in defining the heart of town for the 20,000 people living south of Hwy17. Lots of plazas, underground parking and fabulous views. I live in surrey and think this is a great idea. surrey and richmond need to expand as the density is too great here. North delta and surrey need some good shopping this side of the tunnel can’t wait to move in. It’s criminal that TFN can develop at this scale with autonomy from local communities and growth strategies. The blind optimism of building the retail portions first (as I understand they are doing) without first providing the residential base to support it, could allow this to fall flat on its face. As one poster mentions, a possible scenario would be using the shells of proposed retail spaces for industry. I also question the timing of such a venture…our economy is poised for a long flat period at best. The other rumour out there is that they are simply paving the way for a casino. This would make sense. A casino is far more viable than retail or housing. I have personal experience in dealing with First Nations and land development. Very few band members I met with were concerned about the health of their land. They wanted to know when they were going to get paid, and how much. I hear First Nations talking out of both sides of their mouths…give back our ancestral lands so that we can protect them and have nature provide for us…and, we have the right to turn these same valuable natural lands into housing/land dumps/casinos for cash. The TFN development seems to be a case of the latter. Billy – It is not “criminal”. TFN have the first urban treaty, and they are doing exactly what was expected. The process by which that treaty got approval showed that there was considerable effort by government to secure support. The development that surrounds the TFN lands means that there is no hope for the band to pursue a traditional life. I have not heard the rumour of a casino, which sounds to me a confusion with US bands. There does not need to be a “residential base” if the shopping is a destination to which people are expected to drive considerable distances. It’s just that at $1.44 a litre (US$4 a gallon) there is much less willingness to drive – and that is only going to get worse. As I mentioned, my issue with TFN development is its “scale”, speed and autonomy of the development. I’m fully aware they have the legal right to do what they please. I’m also aware that this is just the tip of the iceberg with treaties that will allow development on native lands. TFN will set a precedent. Stephen – as a former planner, you of all people should recognize the blight of suburban sprawl in North America, starting in the 50s. Your comment, “There does not need to be a “residential base” if the shopping is a destination to which people are expected to drive considerable distances” is odd coming from your profession. This is exactly what we should be avoiding…getting in our cars to get a quart of milk. Ironically, this is what makes Tsawwassen so unique and desirable. BTW – my comment about traditional life was a general one, not focused on TFN lands. As the story below eludes to, all we can do is sit back with hands tied and hope TFN does it right…I sincerely hope they do. Another insightful article about tax base/public amenities concerns. Adding 4000-6000 people in housing on TFN lands will strain Tsawwassen public amenities such as parks, libraries, rec centres etc. As standard practice, regular developers are typically required to “gift” public amenities to the community it works in….affordable housing contributions, waterfront accesses, parks, etc. Does TFN propose anything like this to Delta? I don’t know. Surely, some of those residents will utilize Boundary Bay Park and attend local public schools. Who pays for this? If you own a house on TFN lands, don’t your land taxes go TFN? I’d love to see some comments from Tsawwassen residents. Billy, just because I disagree with what you wrote does not mean I think that the TFN development is a “Good Thing”. Indeed, I wonder now if you actually read the original post, or anything else on I have written on this blog. “Destination shopping” has nothing to do with quarts of milk – that’s “convenience shopping”. The developers, stuck in their 1950s mindset, think that a “mills” development will bring people over long distances. The TFN believe them. I think it unlikely – but some commenters have already shown that not everyone understands our new reality and actually welcome this idea. But then 20% of the electorate say they support Cummins and the BC Conservative Party – and only 8% would vote Green.